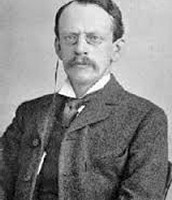 Joseph John Thomson was born in 1856 in Cheetham Hill, Manchester, Lancashire, England. He came from a wealthy, yet average family. Which his mom, Emma worked in her local textile family and his father, Joseph ran an antiquarian bookshop. Along with a younger brother, Frederick. Thomson's early education was in small private schools. Then it all came together. In 1870 he was admitted to Owens College at a ridiculous age of 14. Thomson's father died in 1873 to end plans of Thomson becoming an apprentice engineer to Sharp-Stewart & Co, a locomotive manufacturer. Thomson would move on to Trinity College, Cambridge in 1876. Where Thomson would make his home, achieve, and teach future prospects. 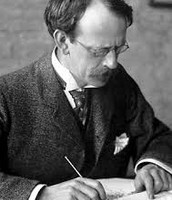 J.J. Thomson took it upon himself to exceed in Science. It came to him like if you had your favorite subject. When in private schools, Thomson didn't waste his education by demonstrating outstanding talent and interest in science. 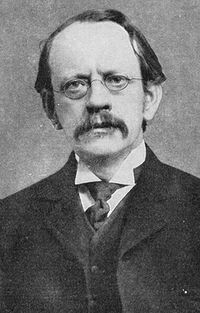 J.J. Thomson had a lot of new propositions and ideas exposed to the scientific community in 1897. On April 30 1897, Thomson proposed the electron. This was a lot to take in. But Thomson through adversity kept adding on. With proof of isotopes, measure mass to charge ratio of cathode rays, electrons had an overall neutral charge,etc... This was alot of work and Thomson admired it. A lot of Thomson's experiments were with one , cathode rays. Thomson had to think outside the box to keep finding new things and ways with the cathode rays. 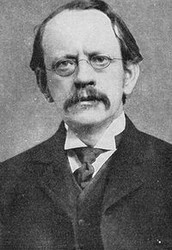 One of the reasons why J.J. Thomson might be regarded as one of or if not the most influential scientist in history is that he has received countless rewards of recognition. Thomson had many experiments and contributions during his time. When Thomson was exploring on the properties of cathode Rays he discovered what he urged to call "corpuscles", soon to be the electron. Exploring the composition of canal rays and neon ions streams through a magnetic and electric field and measuring the deflection. Thomson discovered neon composed of atoms of 2 different atomic masses, (neon 20 and neon 22). Two different isotopes as evidence of isotopes of a stable element and mass spectrometry. 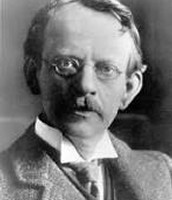 In 1905, Thomson discovered the natural radioactivity of potassium and a year later that hydrogen had only a single electron per atom. Thomson said to be that cathodes were a wholly material and mark the paths of particles of matter charged with negative electricity. Thomson had learned that the magnetic deflection of cathode rays by whatever material of the anode and the gas jar, was the same. Suggesting that the rays were of the same from whatever the origin. Thomson then constructed a Crookes tube, where he observed that the electrometer registered a charge only when he deflected the cathode ray to it with a magnet. Concluding the negative charge and the rays were one and the same. In May-June 1892, Thomson investigated whether or not cathode rays could be deflected by an electric field. he constructed a Crookes tube with a near perfect vacuum of gas. Thomson wasn't able to successfully observe electrical deflection, but changed the the tube to where the glowing patch moved when the polarity was reversed. In a classic experiment, Thomson measured the mass to charge ratio of the cathode rays by measuring ow much the cathode rays were deflected by a magnetic field and comparing it with the electric deflection. 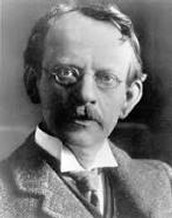 Thomson's conclusions were cathode rays were negatively charged particles which were a universal building block of atoms. Called the particles, corpuscles. The overall neutral charge of the atom was because the corpuscles were distributed in a uniform sea of positive charge, the plum pudding model. If you're thinking of the Micheal Jordan for Science. Thomson would be so, and his name will come in the conversation for the most influential scientist in history. Thomson is like the father of Atoms, he discovered that elusive electron. Also that atoms had a neutral charge, by his plum pudding experiment. Yet, Thomson was a teacher until his death. 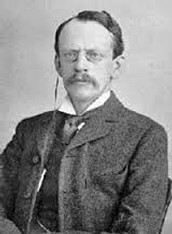 While Thomson was on a roll with discoveries and experiments, he was a gifted teacher and mentoring the next generation of scientists. Future prospects of the scientific world like, Ernest Rutherford, Balthazar van der Pol, Charles T.R. Wilson, and Niels Bohr, just to name a few. Its amazing that Thomson has an idea proved by someone of his own, one of his students, Ernest Rutherford. Showing Thomson's undeniable gift of knowledge. Thomson did so much with the Cathode Rays. Making the Cathode Rays so valuable as one of the most helpful to the additions on the atomic theory. Thomson is with great accommodation on his legacy. Thomson's seven research assistants and his son won Nobel Prizes in Physics. Knighted in 1908 and appointed to the Order of Merit in 1912. Gave the Romanes Lecture in Oxford on "The atomic theory" in 1918. Thomson is buried in Westminster Abbey, close to Isaac Newton. 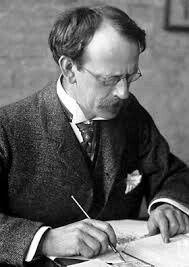 Where he spent most of his life, it's only right Thomson has an Avenue on the University of Cambridge campus and a plaque recognizing J.J. Thomson's discovery of the electron outside the old Cavendish Laboratory in Cambridge. "J. J. Thomson." Wikipedia. Wikimedia Foundation, 12 Nov. 2014. Web. 11 Dec. 2014.